Wholesome Super Food: What would you do when your child score full marks? I was about to go to sleep and the urge to share my thoughts and views about this matter with parents make me open up my laptop to blog. 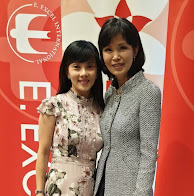 In view of the change to the PSLE scoring system which is affecting my eldest child, how can we embrace the change? I used to be a helicopter / tiger mum who would sit and make sure they finished not just their school and enrichment homework and the house homework as well. It irritated me big time when work was not accomplished at the end of the day. I would also blame them for misbehave and the result for not following what i instructed them. I was then a result oriented person. After embarking on my Healthy Fast Food career, i am thankful to be in a team of great mentors who teach me plenty of life skills and they have change my mindset and how i think and dealt at things differently. My career has shaped and snapped me out of my helicopter parenting to free range parenting which i allow my kids to explore more, make mistakes and to learn to face failure as well as to take ownership of their work at a younger age. So what would you do when your child score full marks? Give them a (big) treat? Praise them none stop for how smart they are? 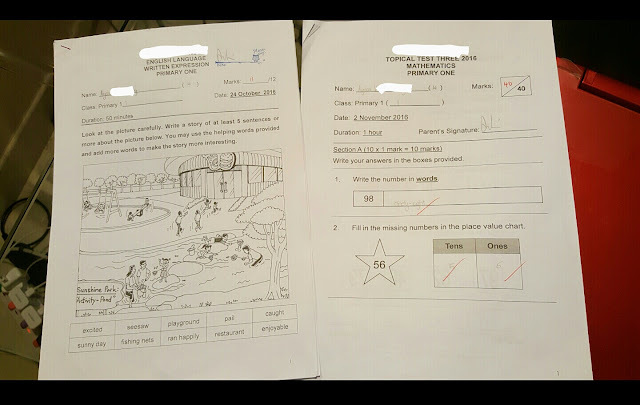 Above are just 2 tests papers i gotten today from her today. I could see that she was really excited to tell me her result immediately when she got off my friend's car. I reached out my hand and give her a firm handshake and congratulated her. I like to do de brief or post mortem with my kids. I led her to see that this time she had put in efforts in revising and it increased her chance of getting higher mark (not full mark). Through this, she learns the cause and effect. It might not drill into her permanently now however when she does not do well in future, i will reinforce what i said. I am setting context on cause and effect. Many years ago, i always say this joke to my hubby. You studied 4 years, your friends studied 3 years in Uni. Ultimately, what matter is who have a more quality lifestyle now? Come to our children generation, probably everyone will have a degree certificate. In years to come, many jobs will be automated and eliminated. Owning a HDB could be 3x of my parent's time for them. How can they stand out in the society in future? How can they survive in the upcoming competitive environment? An acorn will grow into a tree after many years. What you plant today into your beloved child will determine who he is in future. Today plant the seed that you want him to be so that he will grow up to be the tree in the future. We live in a cause and effect world. I am not perfect but doing my best to raise resilient kids with creativity, independence, responsibility, compassion, empathy and love.